"RT, RB" series rail are made from solid poplar. This rail is intended for interior use but may be used for exterior if the rail is treated and painted PRIOR to installation and after all cutting has been done. Rail is available up to 16'. 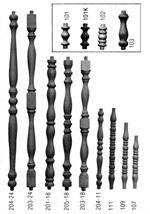 Change the Byron or Mercer Balusters plain "ball" within the turning to a Pineapple"ball"
Change the Byron or Mercer Balusters plain "ball" within the turning to a Reeded "ball"
Use this item if purchasing contemporary ((B4245, B4250, B4255) baluster and want the bottom drilled for a dowel. Decorative bottom cap for use with 3" or 3-1/2" newel posts in a variety of wood species. Widths: 2-1/4" & 2-3/4" Height: 48"
Red Oak: 2-3/4 x 2-3/4 x 48"
Sizes range from 2"-24" tall. Thickness: 1-5/8", 2-1/2" & 3-1/4" Heights: 36" to 96"
Thickness: 2-1/2" & 3-1/4" Heights: 36" to 96"
Thickness: 1-5/8", 2-1/2" Heights: 36", 48", 60"
Thickness: 1-5/8", 2-1/2" & 3-1/4". Many lengths to choose from.